The unique anti-ageing and rejuvenating capabilities of argan plant stem cells. 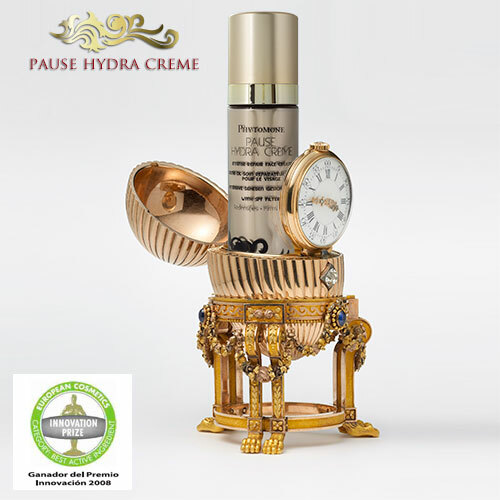 In clinical trials of Pause Hydra Creme over 95% of women saw a significant difference in visible lines and wrinkles within 4 weeks. The unique anti-ageing and rejuvenating capabilities of argan plant stem cells were discovered only a few years ago. Researchers at the University of Toronto identified dermal stem cells, which provide the support and elasticity for the skin. The cells produce collagen and elastin, necessary for continued firmness of the skin. The process renews skin cells and tissue for improving your skin. However, dermal stem cells age in the human body and become less effective as you age. Collagen production diminishes. As a result, your skin starts to age, sometimes prematurely. Those unwanted lines and wrinkles suddenly appear. Luckily, researchers found that plant stem cells from the argan tree work in human tissue to pick up the slack and bring you back your youthful-looking skin! PhytoCellTec™ Argan is the first active ingredient able to protect and revitalise skin stem cells.This not only helps to accelerate the natural skin repair process,but also fights against skin ageing from the root and therefore achieves a fresh and radiant appearance. Argan was developed to improve the regenerative capacity of dermal stem cells,achieving a deep rejuvenation of the skin.This active ingredient is based on Argan tree stem cells,one of the oldest tree species in the world. The trees in question are Argania spinosa, or argan, a species endemic to Morocco and a small region of western Algeria. Goats are drawn to the argan’s fruit, which ripens in June each year. They have no qualms about scampering to the top of the 30-foot-tall trees in search of a feast, and will stand on a skinny branch post-nosh, looking blissed out and whinnying softly. The main function of the dermis is providing mechanical support and elasticity to the skin. In order to maintain these important functions,healthy skin is submitted to a constant cell renovation,which renews and repairs the dermal connective tissue. New cells are produced to replace the damaged or dead ones. Adult dermal stem cells are responsible for this regenerating process and are found in the dermal papilla of the hair follicle.These cells are differentiated in fibroblasts, which are responsible for the on-going production of extracellular matrix proteins: elastin and collagen.However,as dermal stem cells age,they become less numerous and show a reduced activity. As a consequence,the production of collagen and elastin decreases and skin loses firmness- wrinkles appear. Thus,it is important to protect dermal stem cells and maintain its activity. * Epigenesis f. bioi. Theory according to which the features characterising a human being are modelled along its development,without being pre-formed in the germ.